Chapel Hill man charged with first-degree murder of three Muslim students. A North Carolina prosecutor is scrapping the death penalty in hopes of scheduling a trial in July for a man charged with killing three young Muslims four years ago. "Their families have suffered not just the tragic death of three bright, beloved children but the continued delay of the prosecution of their case," DeBerry said. "To insure we are able to bring this case to trial as quickly as possible and help begin the process of healing for the families, I have decided to try this as a noncapital case." DeBerry noted that the womens' father, psychiatrist Mohammad Abu-Salha, testified this week to a congressional hearing on hate crimes. Hicks had expressed hateful comments that the women were wearing head scarves in observance of their faith, he said. 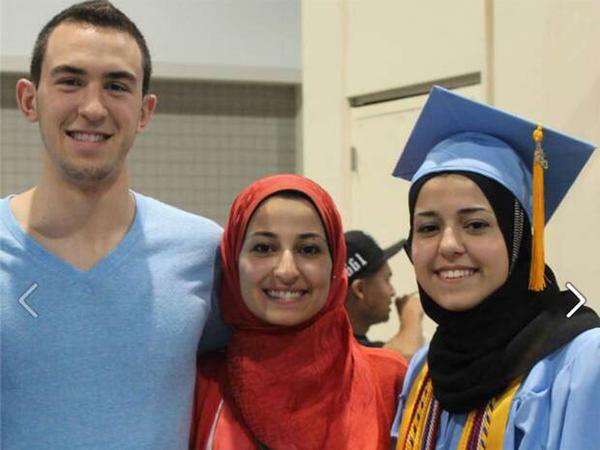 "Three beautiful young Americans were brutally murdered and there is no question in our minds that this tragedy was born of bigotry and hate," Dr. Abu-Salha testified Tuesday before the U.S. House Judiciary Committee. "And because the climate of bigotry is getting worse, I am gravely worried that more tragedies will happen if action is not taken at all levels of government." On February 10th, 2015, Deah Barakat, his wife Yusor Abu-Salha, and her younger sister Razan, were killed in their apartment. This month marks the four year anniversary of their deaths. The family is still waiting on a trial date to be set. Farris Barakat is Deah's older brother. He believes this year might finally hold a trial date, but he and his family are preparing themselves for what emotional baggage that could bring.